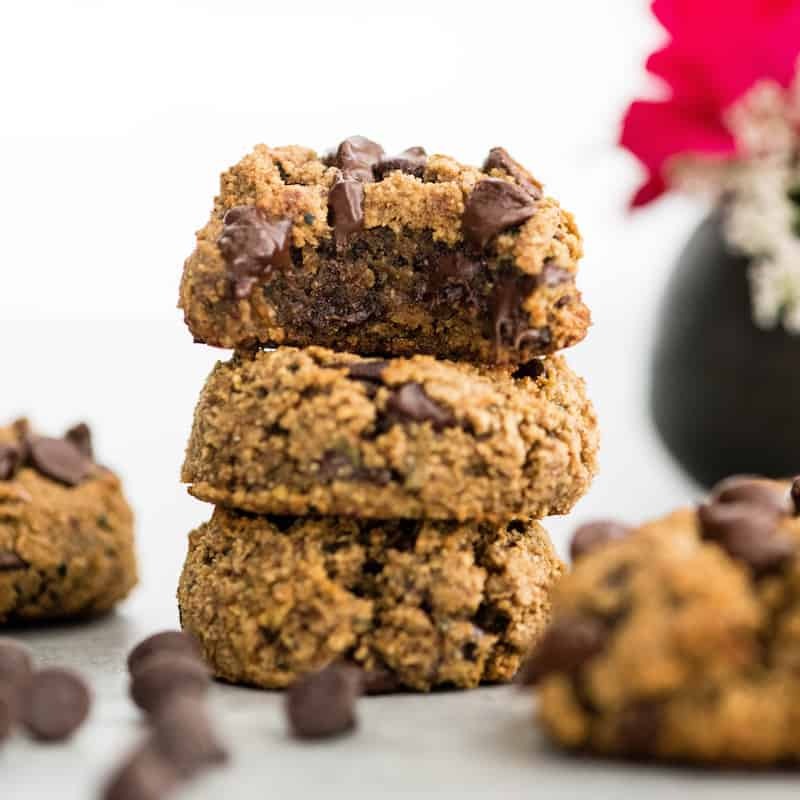 Paleo Zucchini Cookies are a healthy and nutritious recipe loaded with sneaky veggies that tastes like dessert but can be served for breakfast! They’re gluten-free, grain-free, dairy-free, paleo AND are ready in 20 minutes! This post was originally published on March 17, 2016. It has been updated with new photos and a video, however the recipe remains the same. I’ve mentioned before that my kids are into sweet breakfasts. I remember the first time I made them “cookies” in the morning…they flipped and thought I was the coolest mom in the world. Since they loved it, I made it my mission to create healthy breakfast cookies that have a serving of veggies in them. I always start the day with a healthy dose of greens, so I try to do what I can to be sure my kids do too! 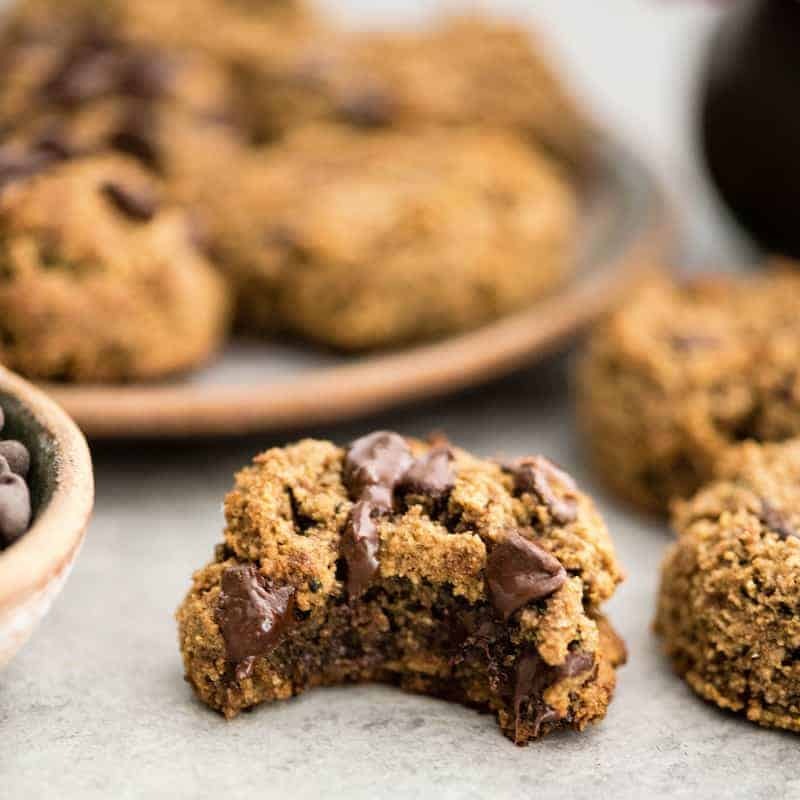 You can serve these paleo breakfast cookies first thing in the AM…but they also hold their own as a delicious after dinner dessert! They are dairy-free, gluten-free, paleo and refined-sugar free! Lining your baking sheet with parchment paper ensures these healthy zucchini cookies are easily removed from the baking sheet. They are very soft, so this is an important step! After baking let the cookies cool on the baking sheet for at least 5 minutes. This gives them time to hold their shape more when removed from the pan! Cookie Scoop The dough on these healthy zucchini cookies is pretty soft (as you can see in the video). Using a cookie scoop to put the dough on the baking sheet makes the process much easier, and far less messy! Baking sheet. A good baking sheet really matters! I love these made by Nordic Ware! Parchment Paper. I buy my parchment paper in pre-cut sheets in bulk once every few years! I am never without it in the kitchen! Almond flour. I do not recommend making any substitutions for the almond flour. Especially do not substitute coconut flour, as they are not interchangeable. You could try a 1:1 gluten-free or paleo baking flour if you would like to try it. Coconut flour. there is no substitute for coconut flour in this recipe! Coconut oil. Butter or ghee can be used in place of coconut oil. Coconut sugar. Any granulated sugar works well in place of coconut sugar! Just be sure to choose a variety that complies with your dietary needs. Chocolate Chips. I used chocolate chunks, but you can use chips of your choosing! To keep these paleo make sure your chocolate is paleo-friendly! I have also used white chocolate chips and Hershey’s cinnamon chips (a pantry staple…so yum) both with rave reviews from my family! 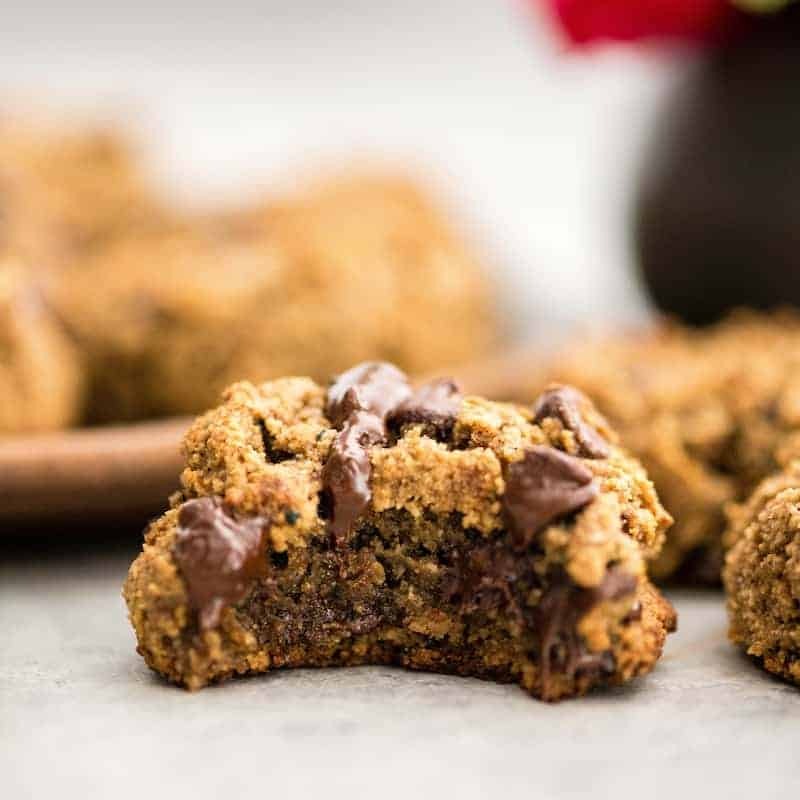 These Healthy No-Bake Chocolate Peanut Butter Cookies are a perfect easy sweet treat! Healthy Peanut Butter Blondies have a sneaky ingredient! 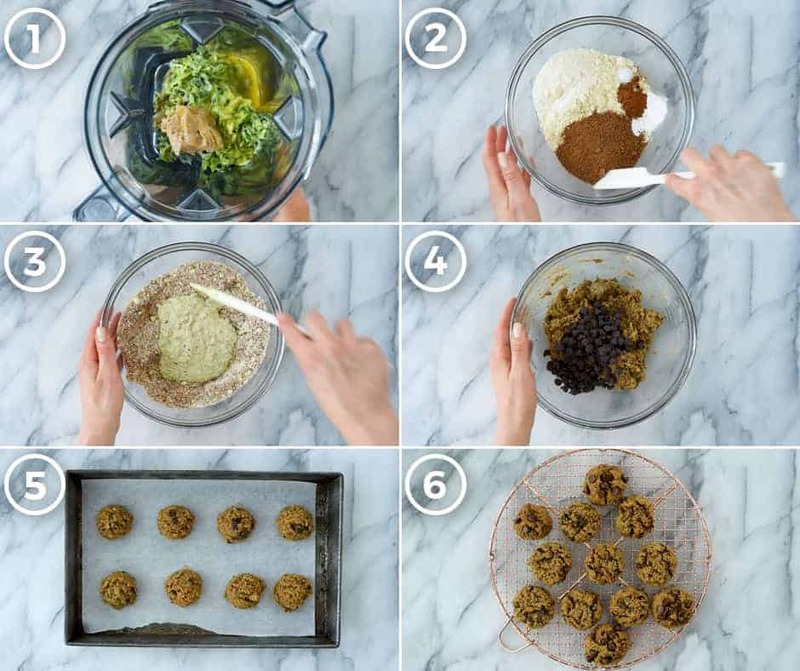 Healthy Banana Oatmeal Cookies are so delicious! Banana Oatmeal Chocolate Chip Cookies are healthy enough for breakfast! 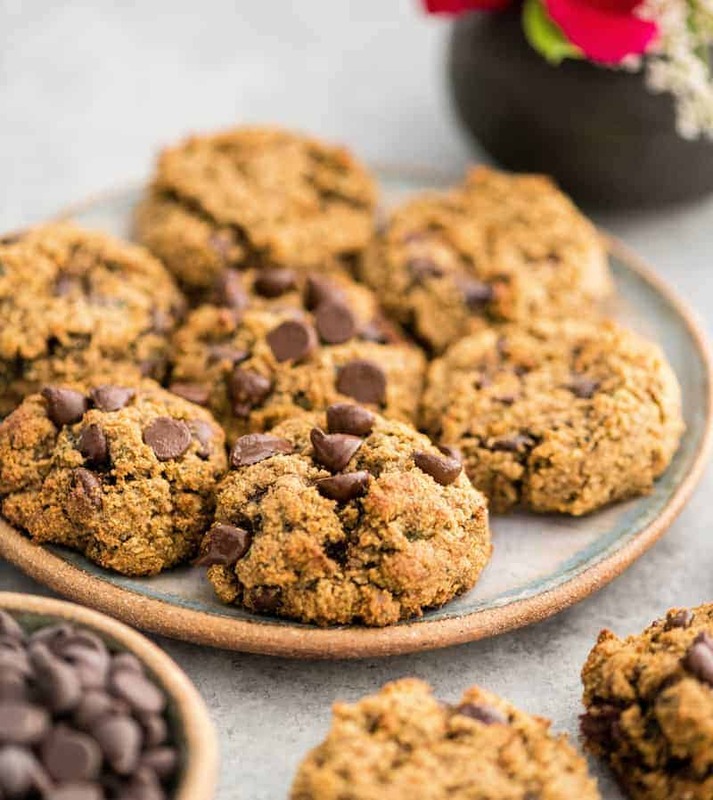 Paleo Zucchini Cookies are a healthy and nutritious recipe loaded with sneaky veggies that tastes like dessert but can be served for breakfast! They're gluten-free, grain-free, dairy-free, paleo AND are ready in 20 minutes! In a medium-sized bowl, mix together dry ingredients (almond flour, coconut flour, baking soda, salt and cinnamon). Set aside. Put zucchini, coconut oil, almond butter and coconut sugar in your blender (Vitamix) or food processor). Blend ingredients together until smooth. Add egg and vanilla and blend for 15 seconds or until just combined. Pour wet ingredients into dry ingredients and mix very well. Scoop 2 TBS portions of cookie dough onto cookie sheet lined with parchment paper. Bake for 10-13 minutes until cookies are slightly browned. Let the cookies cool on the baking sheet for at least 5 minute before removing to a wire rack to cool! I love an excuse to eat cookies for breakfast! Especially when they are so healthy and wholesome like these 🙂 Pinning and can’t wait to try them! 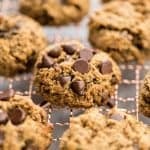 I’ve never made breakfast cookies, but I would love to make these! PINNING! God bless! These sound wonderful! Pinned it! Thanks for sharing with the Thursday Blog Hop! We just went through the “plague” here too, alternating sick kids for the past 2 weeks! Ugh!! Glad everyone is starting feel better there 🙂 These cookies look amazing & my kids will love them! Thank you so much for sharing at the Sunday Fitness & Food Link-Up 🙂 Pinned & Yummed!! I love to impress my grandmother with new recipes involving garden veggies and this one is going to be perfect. I can’t wait to break this recipe out next time I visit. 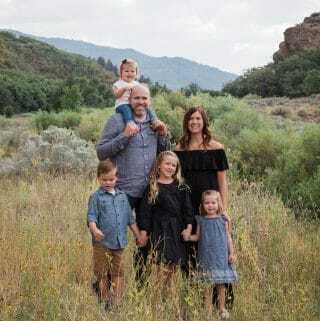 Thanks so much for sharing at Inspiration Thursday! What a great Breakfast Cookie! Hope you have a very special week and thanks so much for sharing with Full Plate Thursday. Congratulations on your Happiness is Homemade feature. 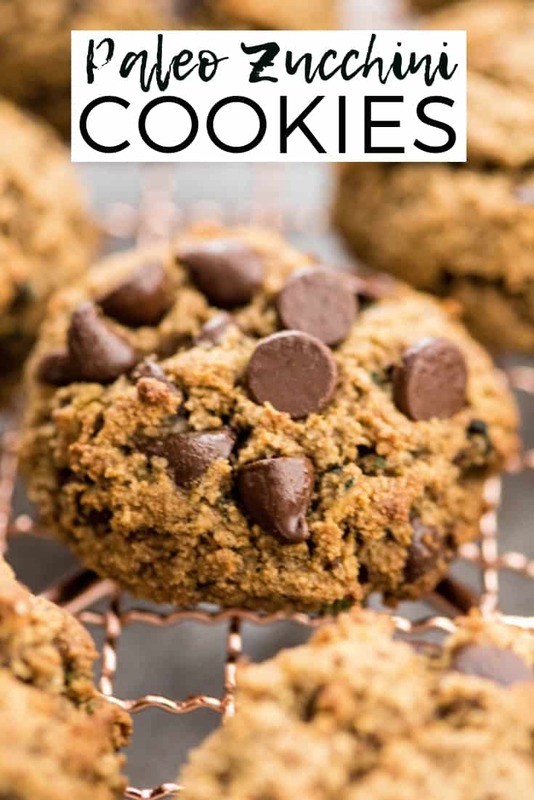 I just pinned this recipe these look so tasty! I’m always looking for ways to hide vegetables and baking for my boys 🙂 congrats on your feature at #HappinessIsHomemade this week, sharing on FB and Twitter! I made these today with the Enjoy Life mini choc chips and they are delicious!! Thanks fir thr amazing recipe!! Yay!! I’m so glad you enjoyed them!!! I’m SO glad you enjoyed them!!! Cookies for breakfast is always a good idea! Do you think this would work with coconut flour and a sunflower butter? My kids can’t have almonds…. Thanks! Excited to try them. These are amazing!!! Do you know the calories per cookie? These look so good! However, I loathe coconut sugar. Do you think they’d hold up with pure maple syrup or honey? Hey Emily! I am not sure if a liquid sweetener would work well because I have never tried it! You could use another granulated sugar, but then it wouldn’t be paleo. If you try the liquid sweetener you might need to increase the amount of almond flour by a TBS or two. Let me know how it goes if you do try it! I just used honey and they are AMAZING!!! I tad moist, but aren’t falling apart. Perhaps would add an additional TSP of coconut flour. I added 1 TBSP of flax seed meal and chia seeds so that might have made them stick together more too..HAPPY BAKING! Delicious recipe for sure!! I was curious, how tightly do you pack your zucchini when measuring? Awesome recipe. Just printed it out. I’ve not been able to find Paleo chocolate chips – which brand do you use? HI! They look great! What do you consider paleo chocolate chips? Do you have a brand in mind? I know Enjoy Life are allergen free, but still a lot of sugar. Thanks! My 19mo, 3yo, husband and I could not stop eating them! Better than any other cookie I’ve ever eaten! I made them with almost 2 cups of zucchini, 2 small eggs and everything else third more than recipe says. I left sugar at 1/2 cup. I shredded the zucchini and we could not taste it at all! I don’t find the blender or parchment paper to be necessary. I used a fine grater for the zucchini and it worked fine. The coookies have enough oil that they don’t stick to a regular cookie sheet. I also used half the sugar because I don’t like things to be too sweet. They taste great.